Shay Olivarria is a financial education speaker and the author of three books on personal finance. Books are available directly from Bigger Than Your Block, Amazon.com or Barnes & Noble. Contact Bigger Than Your Block directly for bulk orders. In this updated version, students will learn about financial institutions, accounts, net worth, compound interest, student loans, the CARD Act and other important topics. Each chapter is written with the intention of providing valuable information that easily understood. Whether you are graduating from high school or graduating from college, this book will help you make sound financial decisions that will increase the likelihood of you keeping your credit scores high (leading to low loan rates), investing for retirement early (take advantage of compound interest), and building a strong financial foundation. Finally, a workbook that makes money management simple! This easy-to-read workbook from personal financial literacy coach and professional speaker Shay Olivarria explains topics such as savings, goal setting, credit reports, credit scoring, net worth and retirement vehicles for the everyday person. As the old saying goes, “time is money” and with this workbook you can save quite a bit of both. The enclosed worksheets help you understand your financial situation and provide the necessary guidance to get your finances under control. In these tough times we must be proactive with our own futures and take control of our money; with Money Matters: The Get It Done in 1 Minute Workbook we can do just that. 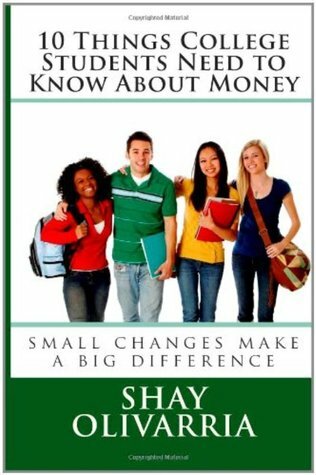 In this autobiographical personal finance book for emancipating foster kids, the most dynamic financial education speaker working today, Shay Olivarria, shares money lessons that she learned during her life while experiencing the physical, emotional, and sexual abuse that led to her being placed in foster care. Everything from finding an apartment and getting the utilities turned on to paying for college and saving for retirement are covered. Resources for emancipating youth shared from organizations across the country are also included. This edition includes a bonus chapter on resumes, interviewing, and career advice.